Are you in the market to purchase your first home in Pennsylvania? Would you like some information regarding programs available that will provide financial assistance? If you answered yes to these two questions, there is great news for you. The state of Pennsylvania provides many local programs and incentives for its residents who are first time home buyers and need help with the down payment and closing costs. Some of these programs provide money that comes in the form of state grants. This is free money that shouldn’t be passed up! The grant awards can be in the thousands of dollars. It will be well worth your time to educate yourself about the programs that the State of Pennsylvania provides. The agency in Pennsylvania that provides closing cost and down payment help to the buyers is The Pennsylvania Housing Finance Agency. While there are no outright cash grants for first time home buyers, there is one program that is very close: HOMEstead. You can get a loan up to $15,000 to use for your down payment and closing costs. This loan has a zero percent interest rate and no monthly payments; it doesn’t have to be repaid until the house is sold or title transferred. In effect, you are getting a grant on the interest. If you kept the house for 30 years, this interest grant would amount to just under $21,000. To find out more about this great program, please visit the Pennsylvania Housing Finance Agency website page specifically describing the details. 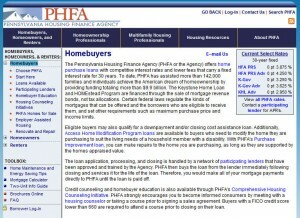 You can go to that page by visiting Pennsylvania home buyer grants. The Pennsylvania Housing Finance Agency (PHFA or the Agency) offers home purchase loans with competitive interest rates and lower fees that carry a fixed interest rate for 30 years. To date, PHFA has assisted more than 142,000 families and individuals achieve the American dream of homeownership by providing funding totaling more than $9.9 billion. The Keystone Home Loan and HOMEstead Program are financed through the sale of mortgage revenue bonds, not tax allocations. Certain federal laws regulate the kinds of mortgages that can be offered and the borrowers who are eligible to receive them, and set other requirements such as maximum purchase price and income limits. Eligible buyers may also qualify for a down payment and/or closing cost assistance loan. Homebuyers eligible for the HOMEstead program may qualify for up to $10,000 in downpayment and closing cost assistance in the form of a no-interest, second mortgage loan. HOMEstead funds are forgiven at 20 percent per year over five years for all loans closed on or after January 1, 2007. The minimum loan amount is $1,000. The first mortgage is provided by PHFA at the same rate as the Keystone Home Loan program. A fee of one percent is applicable, but may be financed by the HOMEstead loan. The federal Department of Housing and Urban Development provides several programs to help families in Pennsylvania with the purchase of a home. The purpose of MIHAP is to provide assistance to qualified moderate income families interested in purchasing a home in the City of Chester. 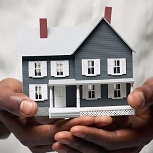 This program provides financial assistance toward eligible closing costs. Not everyone is eligible for MIHAP. To qualify, you must be 18 years of age or older, you must agree to live in the property as your primary residence and you cannot own any rental property. Your household’s income must fall at or below the income limits included in the attached guidelines. The purpose of Homebuyer Assistance Program is to provide assistance to qualified low and moderate-income families interested in purchasing a home in the City of Chester. 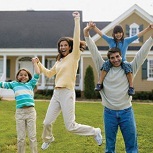 The program provides financial assistance toward the down payment and closing costs. This program provides second or subordinated loans to eligible first-time buyers of Dauphin County homes. Applicants must attend and receive certification of completion from an accredited counseling group. 1st Time Homebuyer – Financial assistance for down payment and/or closing costs for 1st time homebuyers maximum matching grant amount $3,000. For more information, see above. What is the Growing Homeowners Initiative? turn the dream of purchasing a home into a reality. How can Growing Homeowners Initiative funds be used? purchase of a home in Luzerne County. The Trehab Community Action Agency is committed to act as both a service provider and an advocate for the poor, unemployed, and underemployed, the elderly, and other groups at risk. The agency is committed to serving the community as a catalyst for asset building and by helping to increase access to capital. 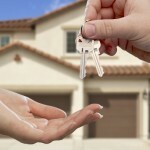 PNHS is a certified housing counseling agency. PNHS is approved by the City of Philadelphia, Office of Housing & Community Development (OHCD)and The Pennsylvania Housing Finance Agency (PHFA) to provide pre-purchase counseling to prospective homebuyers. PNHS’s certified housing counselors provide counseling inclusive of credit and/or loan pre-approval and referral. Philadelphia Neighborhood Housing Services, Inc. (PNHS) is a certified Community Development Financial Institution (CDFI) serving low and moderate income residents of the City of Philadelphia with loans and financial products for home improvement and purchase money mortgages. PNHS offers alternative for residents, who may not meet the loan qualifying standards of conventional lending institutions. PNHS provides these customers with option other than high interest rate loans offered by many high risk, sub prime and predatory lenders. Owning a home is the “American Dream” for many residents of Schuylkill County. Unfortunately, rising real estate prices, inflation, and lack of savings for down payment and closing costs have made that dream seem unrealistic to many. But thanks to the Schuylkill County Homeownership Program, sponsored by Schuylkill Community Action, this dream can become a reality for you and your family. The Homeownership Program enables individuals and families with low-to-moderate incomes to purchase newly constructed homes within Schuylkill County at a price that is very affordable. The Homeownership Program also provides future homebuyers with training to prepare them for homeownership. Providing the new homebuyer with the knowledge of all phases of the home purchase will enable them to make educated decisions. • In conjunction with the Homeownership Program, a grant of up to $1,500 is available to help with closing costs when you purchase a home through this Program. Not only does the Homebuyers Program help qualified buyers purchase homes by providing a subsidy of up to l/2 of the down payment (maximum match dollar to dollar not to exceed $7,000) or 10% of the purchase price of the home, whichever is less, using HOME funds and all eligible closing costs up to $5,000 maximum, it also stimulates the economy by creating jobs, thereby contributing to wages and enhancing local tax bases. income limits, homebuyer requirements, and resale conditions. This Homebuyers Program Description will introduce you to the program. Please take your time and read it and the Homebuyers Flow chart thoroughly. Commonly referred to as the “3/2 Program,” this program offers eligible homebuyers financial assistance for down payment and closing costs. The City and County of York utilize OME Investment Partnership funds to provide up to 2% of the purchase price of a home towards the buyer’s down payment and additional funds towards closing costs for eligible (low- to moderate-income) homebuyers. The Housing Alliance of York administers the program on behalf of the City and County of York. Buyers are required to attend the Housing Alliance of York’s Homebuyer Workshops as a prerequisite for assistance. 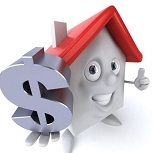 The assistance is in the form of a five year forgivable loan, secured by a second lien against the property. This entry was posted in Down Payment Assistance, First Time Home Buyer Grants, First Time Home Buyer Info, First Time Home Buyer Programs and tagged Bucks County Housing Group, closing cost assistance, down payment assistance, down payment grants, Growing Homeowners Initiative, Homebuyer Assistance Program, HUD grants, MODERATE INCOME HOMEBUYER ASSISTANCE PROGRAM, PA first home buyer incentives, Pennsylvania Housing Finance Agency. Bookmark the permalink.